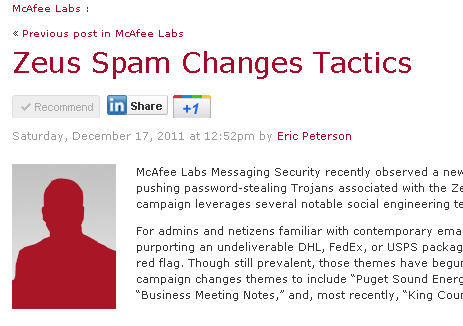 McAfee Labs Messaging Security recently observed a new malicious spam campaign pushing password-stealing Trojans associated with the Zeus/Zbot family. This campaign leverages several notable social engineering techniques. While still employing familiar elements (for example, filenames of “$malware.pdf.exe” that rely on the default Windows configuration that hides extensions for known file types), these messages are representative of the modern approach to malware delivery: Target the recipient with emails designed to provoke curiosity. McAfee Customers are protected against these threats from cloud to appliance, and gateway to end point. Remember folks: defense in depth.